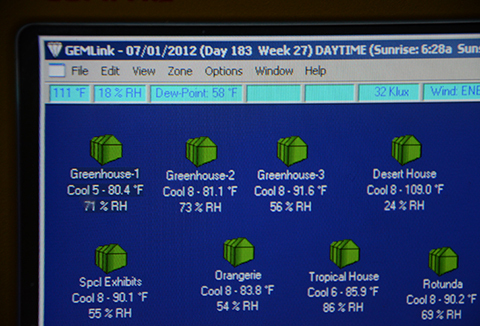 In case you need proof that Atlanta was an oven this weekend, here is a screen shot of one of ABG's greenhouse computers taken yesterday at 3:42 pm. Note the temperature reading from the Conservatory Weather Station in the upper left corner: 111º F.
Saturday was even hotter. At 2:30 pm the Weather Station registered 112.7º. 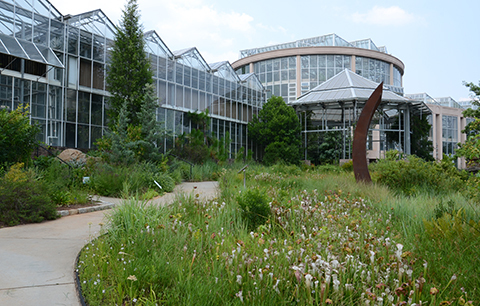 Shortly thereafter three of the greenhouses in the Fuqua Orchid Center reached their high temperature limits. Alarms sounded and staff phones began to ring. Not because any of the cooling equipment had failed; conditions had simply exceeded the capacity of our conventional greenhouse cooling systems. Under these conditions failure of any of the components of any greenhouse cooling system--fan, evaporative cooler, vent-- would have been catastrophic. David Ruland, ABG's Greenhouse Manager, stayed on site throughout the day to monitor our cooling equipment, prepared for emergency action. 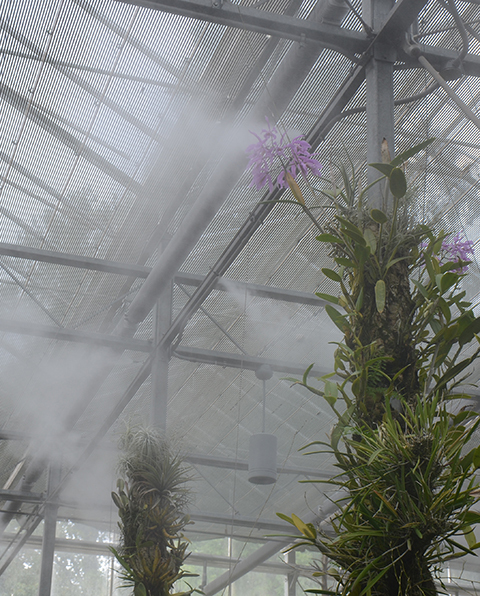 I accessed our greenhouse computers from home via remote dialup in order to close the curtains and increase the fog in the Orchid Center. Which zone fared the best? The Tropical High Elevation House with its muscular Air Washer--the Beast in the Basement--maintained an even 72º. On Sunday it was my turn to babysit the greenhouses. I grabbed my camera and made my rounds. There were lots of visitors Sunday morning, but by afternoon they seemed to have evaporated. I had the bog garden completely to myself. The beautiful White Topped Pitcher Plants (Sarracenia leucophylla) reflected the intense sunlight back to the sky. 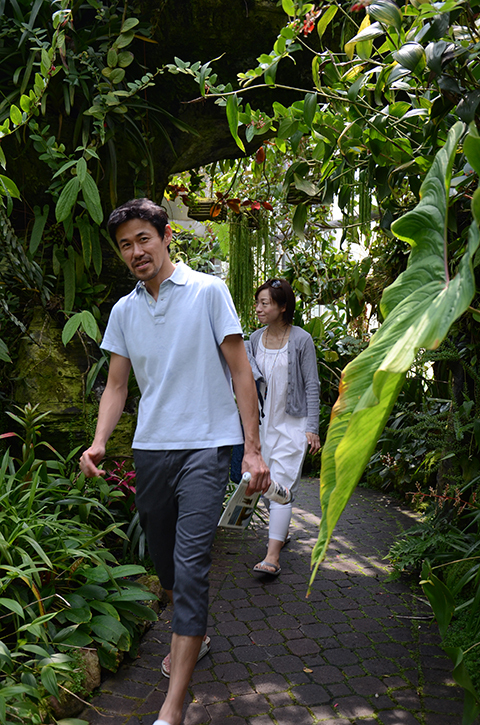 In the afternoon a few drenched but determined individuals made the long trek to the Conservatory entrance where they were welcomed by a docent. Inside the Orchid Display House the curtains were drawn and the fog was cranking like mad. When the relative humidity is low the fog can dramatically cool a greenhouse. Where was everyone? Enjoying the delightfully breezy Tropical High Elevation House. Lots of smiling faces there. 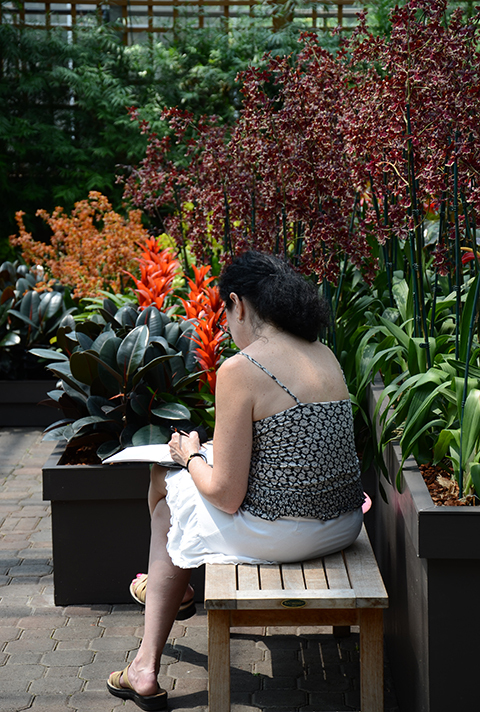 An artist, apparently unfazed by the heat, sketched in the Orchid Atrium for almost an hour. 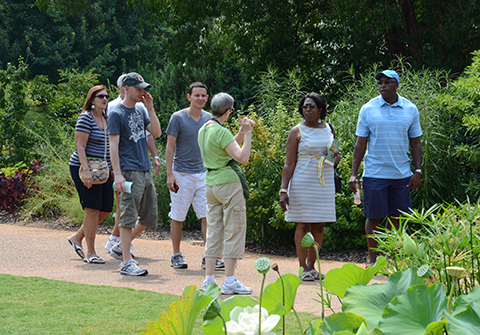 Atlantans aren't wimps about heat, but I think we are all looking forward to seeing highs of 95º again.